Care Packages for Soldiers: Cappy’s Foodie Crew, Shot Spot Bar and Grill and Rack & Tap Sports Bar and Grill Donate Items to the Troops. Cappy’s Foodie Crew, Shot Spot Bar and Grill and Rack & Tap Sports Bar and Grill Donate Items to the Troops. 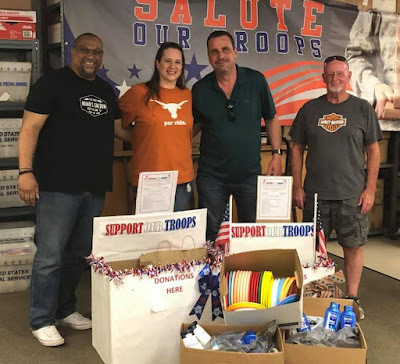 Thank you to Cappy’s Foodie Crew, Shot Spot Bar and Grill and Rack & Tap Sports Bar and Grill for collecting goods for troops as part of the Memorial Day collection drive. These items will be added to the care packages we'll send to our troops serving overseas. Memorial Day collection drive items donated to the troops.